Know for it’s laid-back, coastal vibes, San Diego’s Pacific Beach neighborhood is filled with rooftop bars and fruity cocktails. You’ll be able to admire the Pacific’s famous sunsets as you enjoy some of San Diego’s best food and drink. Join us on a tour to visit all of the great bars below, and more! Looking for the perfect location for families, groups, and even pets to enjoy some great food and drinks? Visit the Backyard Kitchen & Tap! We are just one block off of the beach but you will truly feel at home visiting the Backyard Kitchen & Tap. So Fresh & So Green is a gin cocktail with Hendrick’s as it’s base liquor. To build this cocktail the bartender muddles together cucumber, granny smith apple slices, lime juice, and simple syrup. After muddling they add the gin, shake, and strain into a coupe glass garnishing with a slice of cucumber. It is a light, refreshing cocktail that goes perfectly with a hot summer day on our beautiful patio. As the name suggests, Duck Dive and its ambiance is an ode to the rich surf and beach culture that resides just steps away in the Pacific Ocean and their surrounding neighborhoods and community. They pride themselves on selling quality food and beverages without pretense. Their menu is compiled of takes on classic American dishes as well as coastal favorites. This is a great cocktail made with Altos tequila, fresh watermelon, basil, and jalapeño for a little kick at the end. They’re just steps away from the Pacific so when you walk in you still feel like you’re on the beach (but even better because you’ll have a cocktail in hand). The Local’s menu blends some Local favorites, pub-style grub, and coastal inspirations resulting in a delicious variety of flavors. The cocktails utilize fresh, hand-pressed juices and the beer selection highlights our adoration for the craft beer movement greatly influenced by America’s Finest City. 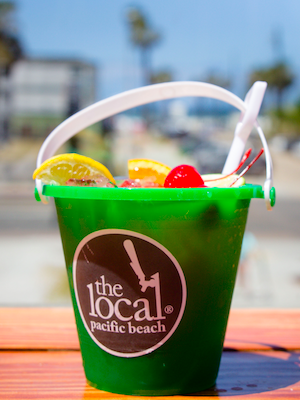 We recommend the Sand Pail Punch for a tropical vacation in your mouth! Made with Bacardi Rum, Malibu, Amaretto, Fresh Squeezed OJ, Pineapple Juice, and Grenadine this one is a sure-fire recipe for a good time in PB. Pro Tip: It’s only $6 for the 32oz. Keep-the-Bucket Margarita on Taco Tuesdays! Their rooftop overlooks Pacific Beach. Their gourmet tacos are made with fresh, local ingredients and served in house-made tortillas. Their bar features a large selection of tequilas, with 18 beers on tap. El Prez is where to drink, where to eat, and where to party in San Diego! This giant cocktail is a large version of one of our best-selling specialty cocktails. We fill it with 5 full shots of Espolone Blanco Tequilla, our house-created Margarita mix, and fresh blueberry puree before adding fresh mint and limes to the 64oz mason jar and muddling and shaking everything together. To finish the cocktail, we garnish it with more fresh mint, blueberries, and an orange slice. It’s served with jumbo bendy straws so you and your friends can enjoy the giant cocktail together! Miss B’s Coconut Club is a revival of Mission Beach’s colorful past. The pin-up girl’s Caribbean curves and demure smile have returned to welcome everyone who steps inside, whether you’re a first timer, a part-timer, or someone who settled in the area and never left. They proudly pour 20 local and microbrew tap handles, along with kombucha on tap and house-made cold brew on nitro. A refreshing summer punch bowl designed to be shared by a small group, the Havana A Good Time is perfect for cyclers popping in after their ride. The drink consists of vodka, Pamplemousse, and house grapefruit and cucumber cordial topped with kombucha. Light and fruity with a hint of citrusy sweet, it’s a surefire crowd pleaser!